A well-placed mat can make a world of difference to the cleanliness and safety of your work environment. Mats catch large amounts of dirt and liquid meaning they keep the mess off of your floors and reduce slip hazards on smooth services. Don’t let mess affect your environment. Allow us to pick up, replace, and clean mats for you regularly, decreasing your housekeeping workload. 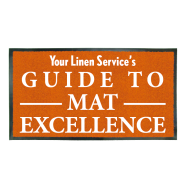 Your Linen Service strives to help our customers reach mat excellence! Need help deciding which mats are best for you? Take a look at the rental mats we have to offer. You never have to look at a dirty mat again!